Toothpaste (called dentifrice by professionals) is nothing more than an additive to the toothbrush to aid in properly cleansing the teeth by eliminating bacterial plaque, stimulating the gums, reducing decay and tartar, reducing root sensitivity, remineralizing enamel, and refreshing the breath. There are literally hundreds of products on the market which will accomplish these tasks to one degree or another. It must always be remembered that it is the mechanical action of the brush itself which removes the bacterial plaque and stimulates the gums. The toothpaste aids in that action but also definitely helps in other areas. The American Dental Association (ADA) states that toothpastes come in paste, gel, and powder form. Common ingredients to most toothpastes are agents for abrasion, flavoring, moisture retention (humectants), thickeners, and detergents to create suds. Fluoride is the most important ingredient in any toothpaste. Fluoride greatly reduces the amount of decay a person has by making the enamel even stronger on adults. Since children up to the age of 17 have extremely tiny openings into the enamel, and since fluoride can penetrate these openings, and since decay cannot occur in the presence of the proper amount of fluoride, this chemical is used as a topical during tooth cleaning. Topical fluoride is not used in cleanings by dentists after age 17 except in special cases. Fluoride in toothpaste also helps remineralize areas which may have just begun to decay. Even if you live in a city with fluoridated water supply, it is still a good preventive technique to always use toothpaste with fluoride. All toothpastes which have the ADA seal of approval contain fluoride and have been proven to be effective against tooth decay. 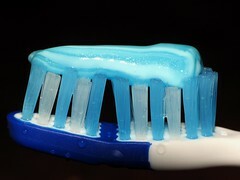 Another ingredient found in some toothpastes is an agent for tartar control. This is often an added abrasive, or multiple agents for plaque control, or even an antibiotic to fend off bacteria. In addition, some toothpastes are designed more for root sensitivity and carry chemical agents which block the discomfort going to the nerves. Whitening agents are an important ingredient to some toothpastes and are an additive of hydrogen peroxide which may lighten stains on teeth over a period of several weeks. A reminder to always purchase a toothpaste which has the ADA seal of approval as it has met the criteria for safety and effectiveness for the claims made on the packaging. This manufacturer must submit proof to the ADA that the dentifrice does in fact perform as advertised. All of these artilces have saved me a lot of headaches. Is Proper Use Of Toothpaste Prevents Decay. I have this Question From So Many Days. And For that, I start My Research and During my Research I found this and this what I was Looking for In this Article, I get My All the Answers and get some extra Knowledge. Thanks for sharing this useful stuff and Keep up the good work.